Mushrooms and thyme work in perfect harmony. Simple as this dish is, it is bursting with flavor. It makes a great starter dish or side salad. 1. Preheat the oven to 200ºC. For the dressing, combine the juice, oil and zest in a small bowl. 2. Place the mushrooms on a large baking tray, sprinkle with thyme and garlic then drizzle with olive oil. Cover with tin foil and roast for 20 minutes. 3. Remove the mushrooms from the oven and toss to combine the flavors. 4. Re-cover and roast for a further 10 minutes or until cooked. Remove the mushrooms from the oven and cut in half. 5. 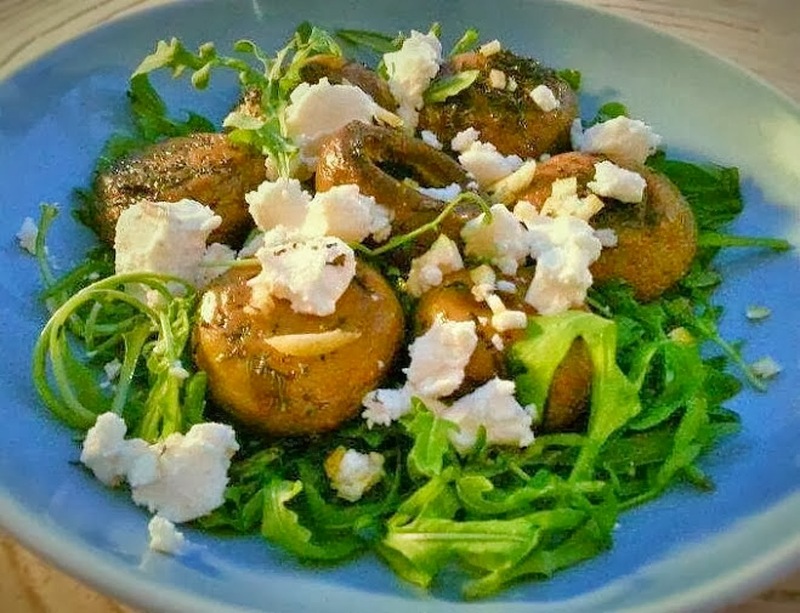 Place the rocket leaves on a serving platter and top with the mushrooms and crumble the goat´s cheese over the top. 6. Whisk the dressing and drizzle over the salad. Serve sprinkled with parsley.